From CNN's Kelly Marshall: Hours before the Senate Armed Services Committee passed a measure Thursday that would repeal "don't ask, don't tell," a group of pastors, priests and rabbis gathered in the Capitol to encourage lawmakers to retain the ban on gays in the military. The group opened the press conference with prayer, asking for God to bless their efforts and to soften the hearts of senators and congressmen to their position. 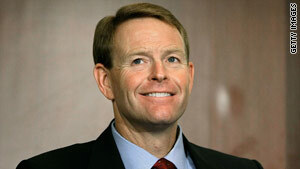 Family Research Council President Tony Perkins, who co-sponsored the presser, said repealing "don't ask, don't tell" could undermine the religious liberties of those serving in the military, particularly military chaplains. “You have over 200 sponsoring organizations that may be prevented from sponsoring chaplains because they hold orthodox Christian views that will be in conflict with what the military says is stated policy,” said Perkins. Next entry »The rise of Historical Jesus, Inc.
why is it that rude and nasty comments are posted–comments made by people who are professionals who work in this situation have their comments ignored. i posted a comment-where is it? Why is DADT such a deal breaker for chaplains? They seem to have reconciled themselves to ministering to those whose job requires them to break the commandment "Thou shall not kill." I would think breaking a Commandment to be a much bigger deal. If you oppose soldiers serving openly, the army is recruiting. If you oppose abortions, lots of kids need adopting. If you oppose civil rights, then feel free to give up your own. Some military personnel undoubtedly want and appreciate chaplains. Others undoubtedly do not. Some chaplains undoubtedly will respond to any soldier, others will not. Wouldn't surprise me if there are gays in each of these groups already, all playing a game called "don't ask, don't tell." Freedom of speech and belief. These men have the right to speak what they believe but being retired military, we need chaplains. Our faith is very important in times of war as well as just every day life. The point is simply this: many chaplains of orthodox persuasion will not be able to "bless", on God's behalf, certain actions of some of the military. Their concern is that they will be blackballed as a result. The contents of this thread make it clear that their fear is well-founded. Toleration is a whole 'nother matter than blessing, but the atmosphere has changed to where toleration is no longer enough. Blessing is now required. Otherwise, you get the "Lord of the Flies"-like narrative above. It would make Joe McCarthy proud. I don't see that anybody is suggesting that a chaplain would refuse to comfort a gay soldier at the loss of a fellow soldier, for instance. It would interesting to find out what these people really had in mind before vilifying them. Failing to do so is the very essence of bigotry. Obviously the voodoo dolls did not work nor did the curses set upon said military by the horned god and his three goddesses. if they won't do the job required of them, fire them like you would in any other profession. I wish they wouldn't report on the Family Research Council without mentioning that their entire purpose is to oppose anything that might be of benefit to the gay community. I note that this article never mentions WHY traditional chaplains would be barred – going with the FRC's normal MO I'm going to say that that's because there is no actual legal rationale and this is just fear mongering. What does DADT have to do with "religious liberties"? Perkins may have well said "Repealing DADT will undermine my cult... and my harem of teenage girls... and my privately owned island." Most Christian religions state that killing is against God's wishes, but that hasn't stopped Chaplain's from serving so far. Muslim Chaplains, albeit the small minority that they are, are supporting troops who are currently killing fellow Muslims. This hasn't stopped them from serving. They are obviously desperate. And the sad thing is, I'm strongly conservative. Wish someone in politics actually represented my point of view anymore. 21 years in the Army. Currently in Afghanistan. In general, chaplains are of nominal value to our mission. They are generally drawn from a group of people who otherwise would not be officers and could not find other gainful employment. Unlike other endeavors in the military it is acceptable to be inadequate as a chaplain so long as you're doing it in the name of the Lord. Any random sample of chaplains in the Army today would prove my point. Most chaplains know better than to proselytize but too many do not. The non-religious functions they serve such as marriage or grief counseling can (and often are) performed by more qualified secular professionals. Soldiers who lose a buddy get comfort from their other buddies, not the chaplain who is not one of them and does not share their hardships in any meaningful way. While I realize believers need them to practice their faith (I guess), personally, if chaplains weren't in the Army it wouldn't make a bit of difference to me. I think they're deadweight. Replace them Soldiers who can carry a rifle. I am so TIRED of everyone else sounding off about military service. If you aren't in uniform it is honestly shouldn't concern you! Especially those who want to enforce their religious views upon us. I have been serving in the military for over 10 years and it is time for this policy to end. I have had the opportunity to deploy with our allies and if Isreal can have open service members; a country which is essentially the birth place present day religion; why can't we? It has nothing to do with readiness....we are behind the times. So those of you who want to impose your religious views upon me and my uniform....raise your right hand after you talk to a recruiter and pass all the test and finish BMT...otherwise focus on your personal lives. And those of you who have worn this uniform and no longer wear it....again focus on your own lives...you are respectfully a has been...unless you actually took the time to retire out. Your first two sentences were dead on correct.And i agree completely. You really lost me after that. I'm a republican but ole George W was a spoiled rich party boy who wouldn't serve in our countries time of need. Us repubs deserve so much better. How absurd. Laughing out loud at your intense and disgusting ignorance. You are why fundamentalists are so dangerous to the USA. Every American is to be ashamed that religion has a haven in our military. This is a crime – the abuse of the mind, fostering ignorance and hate in the front-line soldier, already at a disadvantage because they are overwhelmingly young, poor, from the Midwest, or otherwise disadvantaged. Instead of chaplains the American people should demand professors to educate the front-line soldier on global politics, history, and social science. Religion is a pox on humanity, a disease of the mind. I'll say again, the right-wing agenda in America to silence and oppress the lgbt community is a doomed effort – you will lose, we will fight you in the streets for our rights. Nobody in government is listening to the frauds in this article, rest assured. Demand of your Senators and Representatives that religion pay taxes like other private enterprise (like the fortune-teller shop). Being from the Midwest is a disadvantage? Elitist much?